It’s very easy to get started with Office 365, but it's very difficult to get the insight on users available in your tenant. Though Office 365 Admin Center can provide some basic reports, those are pretty useless, most of the time you need to play hard with get-msoluser PowerShell cmdlet to retrieve a simple piece of user information. AdminDroid Office 365 Reporter helps you by providing detailed analytics and reports on user objects exist in your Office 365 environment. These statistics help the administrator to make the decision faster and better. 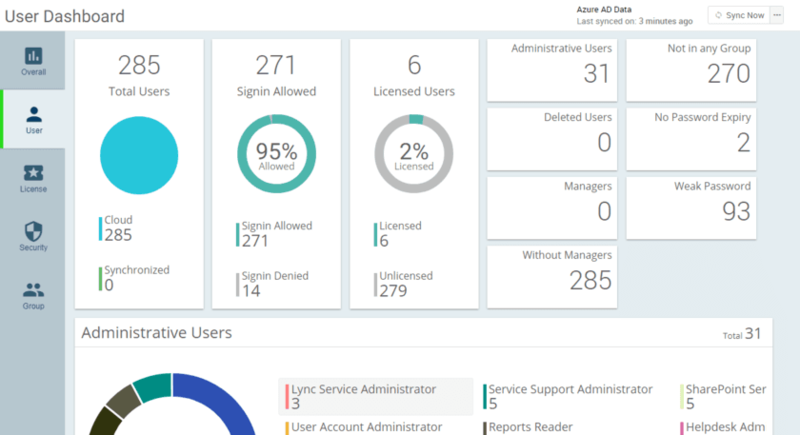 You can get a clear understanding of your Office 365 user information by having a quick glance on user analytics dashboard. You can get more detailed reports on every available analytics by clicking the statistics. Number of enabled (sign-in allowed) and disabled (sign-in blocked) users. Following are the user reports offered by AdminDroid Office 365 Reporter. You can schedule one or more reports to run automatically at configured time and delivered straight to your preferred mail-ids. You can export the report results to CSV, Excel (XLS/ XLSX), HTML or PDF. This report provides detailed info on all the user accounts available in your Office 365 space. This report provides all the available properties in the user object. You can just customize which properties can be shown in the default report view. Using the easy search option provided inside the report, you can search for any user in your organization to get detailed info. This report provides the list of disabled users in your Office 365 users. It helps you to understand which users accounts are blocked to sign-in. If any of these disabled users accounts assigned to Office 365 license, then you can free up the license to use for any new user accounts. This report provides the list of enabled user accounts in your organization. All the enabled users can sign-in to Office 365 portal and use the allocated Office 365 services. This report provides the list of deleted users accounts in your Office 365 organization. Recently deleted objects appear at the top of the results, and you can know when the account was deleted. Additionally, it provides the information of whether the user account can be restored from the recycle bin or not. 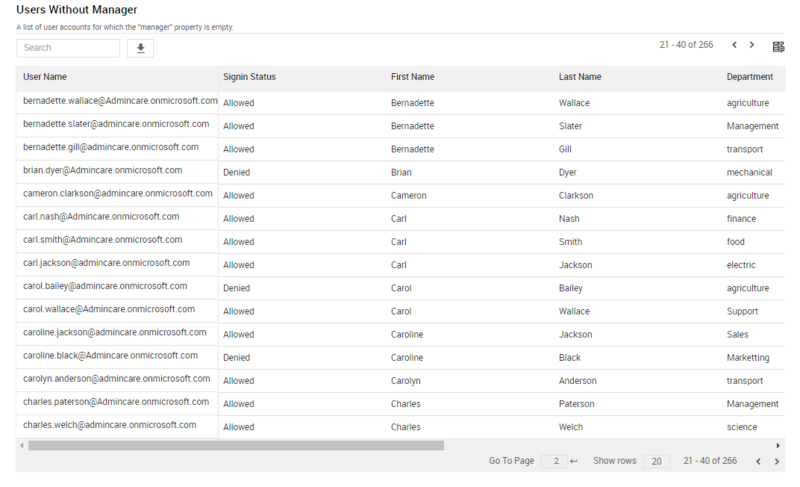 Office 365 portal shows the deleted account in the portal for retention period only, but AdminDroid provides the complete history of deleted user accounts from when you started using the tool. Through this report, you can identify the user accounts which are not reporting to any managers. This report will help you to manage your organization structure tidy. This report gives information on user accounts which are not part of any of the security or distribution groups. Users need to be part of groups to receive group emails and ensure the security permissions. So using this report admin can analyze why some user accounts are not part of any groups. This report provides a complete list of all manager in your organization. Additionally, you can get to know about how many direct reports are assigned to each of these managers. This report gives you the list of users synchronized from your on-premise Active Directory. The objects are listed in the order such that the recently synchronized users come at the top of the report. You can get to know when the particular user account was synced from your AD by checking the Last Dirsync Time property. This report returns all the contacts stored in your office 365 directory. The search option provided inside the report helps you to find out your organization contact quickly.